Scientists studying the human immunodeficiency virus (HIV) have discovered a novel protein the virus uses to infect the host’s healthy cells, reports a recent pair of studies. Each year, according to estimates from the Centers for Disease Control and Prevention, approximately 50,000 people get newly diagnosed with HIV. Treatment for infection has advanced markedly within the last decade, leading to survival rates equaling those of healthy people. However, these cases are at the upper crust. For the some 1.5 million people who died of HIV/AIDS in 2013, the disease that results from the virus, research still has a long way to go. 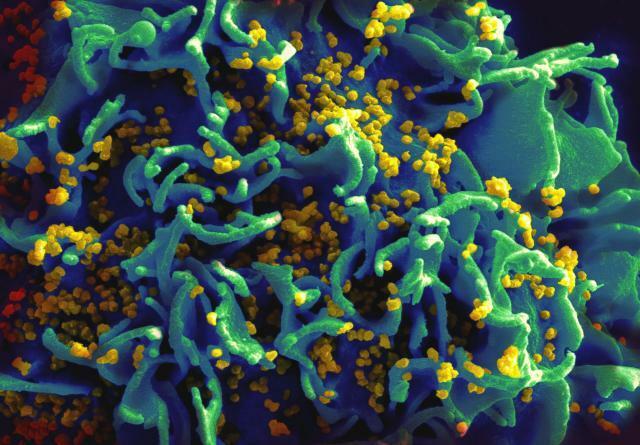 The latest studies add to a growing body of knowledge surrounding HIV. Specifically, they target a vital spike protein — basically, a cluster of plasma cells that have negative effects on immune function and blood thickness. When HIV invades the body, it seeks out healthy cells to latch onto and pry open. The challenge was, researchers couldn’t determine why antibodies had such trouble working against them. “Now we can see how this fusion machine works, and in a general way it is similar to how fusion works in influenza and Ebola," said Walther Mothes, associate professor of microbial pathogenesis at Yale University and co-senior author of a paper published in Science, in a statement. The other study was published in the journal Nature. To fuse with cells and later to infect them, the spike protein needs to stay in an “open state.” But in this open state the protein is vulnerable to antibodies, which seek to destroy the biological imbalance. So the protein stays in a closed state for most of its stay once it’s fused with the cell, opening only a short while to attack. The research comes on the heels of separate research that found a unique set of antibodies keep the protein in a closed state among AIDS patients. "The determination of the structure of this closed configuration of the HIV spike protein and the direct visualization of its fast openings represent a major step forward for drug and vaccine design," Mothes said. HIV research has seen something of a setback in recent weeks. In 2013, Mississippi doctors heralded a new era of treatment after two babies, born within roughly a year of each other to mothers who both had HIV, received treatment within hours of being born. Doctors called it a “functional cure”: the virus was still present at minute traces, but caused no symptoms. A second baby, born in Milan, went symptom-free until age 3. Now both children will be on antiretroviral medication indefinitely. Sources: Pancera M, Zhou T, Druz A, et al. Structure and immune recognition of trimeric pre-fusion HIV-1 Env. Nature. 2014.